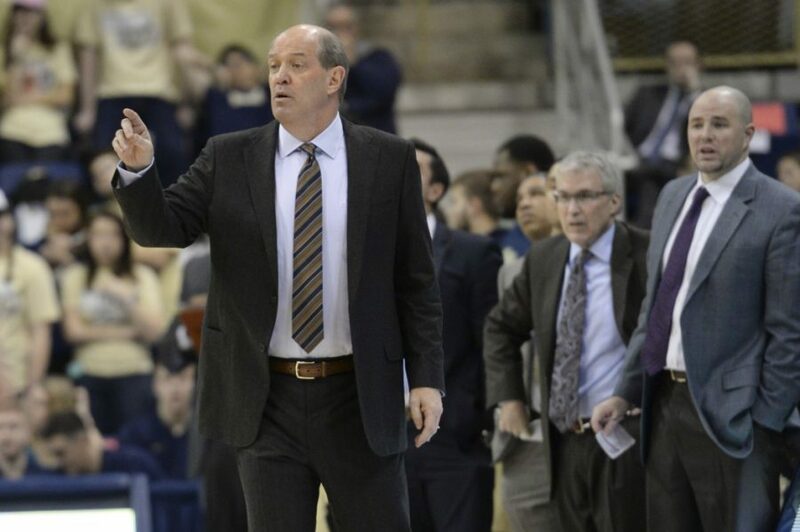 Coming off its worst season since 2000, the Pitt men’s basketball program will attempt to rebound this year as head coach Kevin Stallings enters year two of his tenure. This season’s team will be made up of almost entirely new faces, with only three players returning from last year’s squad. During the offseason, four of the team’s starting five players graduated, while redshirt sophomore Cam Johnson — the fifth starter — transferred along with four others. Stallings’s 2017 recruiting class features a wide variety of players from different backgrounds, with some coming out of high school while others are graduate and junior college transfers. With all the new players, it will be tough for the program to climb back above .500 this year. But Stallings is ready to put last year behind him, and was optimistic about the future of the program when The Pitt News sat down with him earlier this month. TPN: Looking back to last season, you obviously didn’t do as well as you wanted to. Where do you think things went wrong? If you had a second chance would you do anything differently? Mike continued to play but was affected by the mask obviously because he had been playing well and then his numbers dropped off. Anyways, in terms of where it went wrong, you know we played some awful good teams. I think we had the sixth toughest schedule in the country. We were not a complete team. We didn’t have a true point guard, we didn’t have a true center, at least ACC-level guys I’m talking about, and this is a tough league to win in if you don’t have all your parts. I thought our guys for the most part played reasonably hard, [but] we never quite defended like I thought we could have and maybe should have. If I had to do something differently maybe I would have subbed or taken some guys out of the lineup, because we never embraced the defensive end quite like I thought we could have. TPN: In February, you already had seven recruits either committed or signed. What went into the decision to overhaul the roster and do you think that had an effect on the mindset of some of the bench players, knowing they might not be coming back? Stallings: No, I don’t think that who we signed probably had a whole lot of impact to the bench players not coming back. [Justice Kithcart] was dismissed from the team and [Crisshawn Clark] was told by our doctors that he would not be cleared to play because of a third ACL injury on the same knee. Now he announced he was transferring and that’s fine, but our doctors weren’t going to clear him to play, and he had been told that. The other guys asked about their future in the program and what role I saw them being able to play. It’s my job, because I care about these guys and their future, to be as honest with them as I can be, and I was very clear in what I thought their future looked like here. I think for those reasons they decided to transfer, which I completely understood because these kids want to play and be in a program where they can have an impact and affect winning. I don’t think it had anything to do with the guys we’d signed. I think it had more to do with the fact that they wanted to know what my mindset was relative to how they could impact next year’s team and beyond. TPN: Later in the season, you mentioned in a couple of interviews you talked to Ryan Luther and Cam Johnson about leadership for next year’s team. When Johnson transferred in the beginning of April, how much will that hurt next year’s team? Stallings: That remains to be seen. You don’t know if it’ll hurt a lot or it won’t hurt any. It’s hard to make that assessment. Cam is a guy that we liked. He’s a guy that played well for us. I think we played well for him. When you go from averaging 12 or 13 minutes and five points one year and you average 33 minutes and 12.5 points the next year, I think we did some things that helped Cam be a better player. So that was a mutually beneficial relationship and the way it was described to me, they made the decision three years ago that they were going to do this. As soon as he redshirted his freshman year, his father told me that this was their plan. They said it wouldn’t have mattered who the coach was, this was their plan. I don’t know if [it’s] exactly the way it is or not, but that’s what was told to me. How it affects next year’s team remains to be seen. We would’ve loved for Cam to have been back. He wanted to leave and go some place else and we granted him that release and now we’ll worry about the guys that are going to be here. TPN: Later in the month, two of your own recruits, Aaron Thompson — who you let out of his Letter of Intent — and Troy Simons — who went to New Mexico — decommitted. Is that any more concerning for you considering that they’re your own players? Stallings: No, because the Simons thing was our decision because it was clear to us that there were potentially some eligibility issues. Aaron’s thing was a personal matter. You hate to see those things come up, but no [it’s not more concerning]. You’re kind of asking questions like, “Should there be a panic around the program?” and let me tell you that, for us to make the progress that we needed to make, certain decisions had to be made. Some of those decisions were hard decisions. We have a plan in place that we’re very convicted about and confident in, to get guys in here that will be able to produce and thrive in a winning culture. We need selfless players. We need dependable people. We need physically and mentally tough players. Everything we do right now revolves around getting guys in here that have those attributes that can help us make this a winning culture. It became very clear to me after I was here a short time that there would be a lot of turnover on this team. We had a [large] number of seniors and we had some guys that I didn’t anticipate would play very much. Every kid wants to play, so you have to anticipate that some of them are going to leave. That is in fact what happened. We did have two unexpected departures. We did not expect Cam to leave and we did not expect for Aaron to ask out of his letter. The way that we will overcome the unexpected departures is through our continued efforts in recruiting the kinds of guys that want to be here and help us create a winning culture. Forty percent of Division I players transfer. It’s an epidemic all over the country… Everybody is still looking for players and it’s different than it used to be. It used to be that when May came, we all got to relax. That was our best month, and now we work harder in May than we do in any other month, really. Because we have a fluid culture in college basketball, we are adapting to that fluidity. You recruit longer, you recruit later, and you expect more change because that’s the nature of it right now. Kids are going from low-major programs to Final Four programs because everybody needs a guy. It’s been a hard spring, but not because all of this was unanticipated or unexpected. Some of it was very much part of the plan, and any successful basketball program begins with a plan. The ones that succeed are the ones that have a good plan and the conviction and confidence to execute the plan. That’s where we’re at, we’re just in the process of executing the plan that primarily I have created. TPN: Looking at the five-man class you have now, what do you like about the group and does anyone stick out to you above the others? Stallings: I don’t know that anybody sticks out to me above all the others. I think that we have three or four guys that are going to come in here and really impact our team next year, whether that be in a starting capacity [or not]. What I like about it, is that first of all, we’ve added a true point guard and some size — both of which we really needed. We’ve added some shooting and some athleticism, [and these are] all components that make up most of the good ACC teams. Now how quickly we’ll be able to get that put together and make it look like the product we want it to be, I have no way of knowing right now. I like the guys that we’ve added because we’ve addressed a lot of different things with this class. We’re not finished yet, and we’re still continuing to add … I think we have some size and I think we have some athleticism on the wing. We have some physicality, which is nice especially in younger guys. Hopefully, we have some point guard play that will allow us to be a better thinking team on the court. TPN: To close out the class, what are you looking for and where are you looking? Is it mostly the grad transfer market or are you looking at different options? Stallings: We’re looking for it from everywhere. We’re presently looking at transfers, graduate transfers, high school kids, a few junior college kids — not many, but a few — and foreign kids. So, anything that fits into that box of recruiting, we are actively pursuing and actively trying to uncover additional prospects. The interesting thing about where recruiting is going now is that there are still going to be a lot of kids that are going to come onto the available market, particularly transfers, because that’s the nature of the way things are going. So, the answer is broad because we’re going down every pathway that we can to find the right guys to help us build this culture and program the way we want to build it. TPN: When you come back in the fall, you’ll have all these new players come together with no experience in terms of playing with each other. What are the challenges of getting them to be a cohesive unit and getting them ready for ACC play? Stallings: Well, first of all, that begins earlier than the fall, because some of them will come for the first summer session and some others will be here for the second summer session. So we’ll gain more guys as we go along during the summertime, and we’ll be able to begin that process earlier than the fall. It will be a challenge, but it’s about the same as the challenge was when I came in here last year as a first year head coach. I took over guys that had no idea what I wanted or how we did things, so it’s kind of like going through year one all over again. I think Ryan Luther and Zach Smith and the guys that will come back from last year’s team will be able to provide a great deal of leadership because they have been through what we want for a year. But, it’s also what makes it exciting, because the most exciting thing for me as a college coach is that process of putting a team and a program together and helping guys understand how they need to be dependent on one another to make all of this work the best it can. When they start trickling in here, we get to start doing that and that’s what I’m looking forward to. TPN: That being said, what most excites you about next season and what are you least looking forward to? Stallings: What I’m most looking forward to is executing this part of the plan — getting the guys in here that buy into dependability, selflessness and being physically and mentally tough as it pertains to playing and building a winning culture. This is almost like chapter one of us building and beginning the type of culture that we need here to sustain long-term success. The thing that I look least forward to is anytime I feel like we don’t play up to our capabilities. That doesn’t necessarily mean when we lose, that just means when we don’t play up to the standard we know is within our capabilities. We’ll work hard to help this team reach it’s potential, whatever that potential is, but I won’t know that for some time. TPN: You said you were looking for players that want to buy into the culture you’re trying to create here. Do you think that’s something the players last year failed to do? Stallings: I wouldn’t say that. I would just say that it was a difficult proposition for them, because a lot of them had been used to doing things one way. Then, I came in and we want things done differently. For some others, it was difficult to buy into what we wanted because they weren’t getting the kind of playing time they desired to get, and sometimes guys don’t buy in when they’re not getting what they want in return. It just created a difficult dynamic for everyone involved, but I don’t think it was something they failed to do. It was just something that didn’t happen to the level that we had hoped it could and think it will going forward. TPN: All things considered, what, in your mind, would be a realistic expectation for next year’s team? Stallings: I would have no way of telling you that until I lay eyes on them in a gym and am able to work with them for a while. Again, with that many new faces, I couldn’t sit here and say X, or Y or Z because there’s no way to assess that without seeing what their capabilities and coachability are like. So, I’ll have to ask for a rain check on that question and maybe you can ask me a little later.